"Just one telephone call can create endless opportunities" - view more famous quotes! SUBSCRIBE + GET a FREE GIFT! Enter your email address below in the yellow box to start your FREE WEEKLY EMAIL TIPS! After you subscribe you will immediately receive a welcome email that includes your free pre-call planning cold call download gift (a $19 value). Mr. Cold Call™ is a service of Mr. Cold Call, Inc. The Pop Icon Mr. Cold Call Pre-Call Planning Cold Call Script™ helps you to strategically plan each stage of the sales process from "Attention-Getting" Sales Openers to Asking Engaging Questions to Overcoming Sales Objections to Closing Sales Questions to Leaving Voice Mail Messages for your sales prospect. The time is now to super-charge your sales success! What cold calling and sales prospecting topics does this FREE WEEKLY NEWSLETTER cover? This ezine provides practical, creative and fun ways to prospect both over the phone and in-person. Topics include pre-call planning, personal development such as developing a positive attitude, ice-breaking sales openers, script writing, leaving effective voice mail messages, setting appointments, objection handling, asking engaging questions, bypassing screeners, office environment strategies, follow-up and asking for referrals. *If you are updating your profile please enter your email address, click the submit button and you will instantly receive an email that allows you to update your profile. *When you become a Mr. Cold Call subscriber please make sure that you add our email address weeklytips@mrcoldcall.com to your address book to insure that you continue to receive our weekly tips. Pop Icon Mr. Cold Call™ - #1 source for the most cutting-edge cold call technology! Top Dog Sales Secrets Book for $24.95 - Get 70 Sales Bonuses worth over $3,000! FREE Pop Icon Mr. Cold Call™ Downloads - Create More Sales TODAY! LEAD CALCULATOR DOWNLOAD - Where are your top sales coming from? COLD CALLING RECORDER DOWNLOAD - Do you track your phone calls? REFERRAL PROGRAM - Are you looking to dramatically increase referrals? Local Coupon Marketing™ Enters Into Exclusive Agreement with Mr. Cold Call, Inc.
Off The Hook Media™ Announces Release of "The Mr. 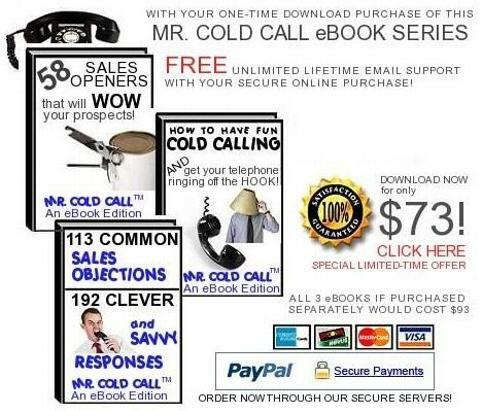 Cold Call™ eBook Series"
This sales technique was discussed in Mr. Cold Call's latest eBook called "How to Have Fun Cold Calling and Get Your Telephone Ringing off the Hook!" PLACE THESE MOTIVATIONAL QUOTES ON YOUR SALES PACKAGES! In an effort to increase the open ratios of the packages that you send to prospects feel free to download these quotes. All you need to do is replace your existing paper with sheets of labels and then selectively peel off the ones that you want to include on your packages to prospects! Each download contains one motivational quote for each author. There are a total of 30 labels per page (three labels horizontally and ten labels vertically). 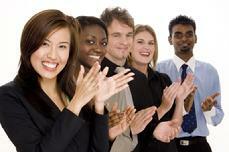 "Creative Ideas To Get Your Prospects To Open Your Sales Package!" This site uses SSL technology to guarantee a safe and secure shopping environment. Online payments are processed by Paypal our secure payment provider. No need to register if you do not have a PayPal account.